MONTREAL — Ringing your bell. Getting rattled. A knock on the noggin. Brain damage. Concussions are a silent epidemic that has long been associated with professional contact sports, but there is evidence that concussions among teenagers and pre-teens are more common, and more damaging, than previously believed. Experts estimate that 20,000 Canadian junior hockey players will suffer a concussion this season, and that most will try to play through the brain damage, all while encouraged by coaches, fellow players and parents. Hockey players in Quebec are not allowed to give bodychecks until they are 13 years old, two years older than their counterparts in the rest of the country. It's a move that USA Hockey is considering because medical researchers are showing that allowing children to bodycheck can easily cause concussions. Mathieu Menniti knows the danger all too well after the Midget player was seriously injured during a game. "I got hit from behind. A player jumped on my back I went head first into the boards, and I stayed down, because I knew something was wrong. It felt different," said Mathieu. Three other players on his Midget Espoir team, including George Stuart, have also suffered concussions this season alone. "I was pretty worried because at first I wasn't sure what was happening," said George. "I was kind of dizzy, confused. It was scary I have to say." 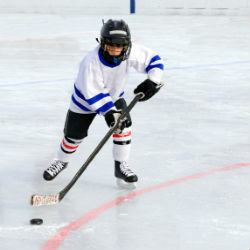 Research at the University of Calgary published in the Journal of the American Medical Association followed thousands of Peewee players, aged 11 and 12, in Quebec and Alberta. 73 Alberta players suffered concussions in 2007-2008, with 14 of those concussions considered severe. In Quebec, where bodychecking is banned, only 20 players suffered head injuries -- four of them severe. A University of Alberta study followed two minor leagues in Edmonton last season, and found that ten percent of players missed at least one game because of a concussion. In Ontario the statistics were even worse, with 25 percent of players suffering mild brain trauma. 300 children visited The Montreal Children's Hospital's concussion clinic this past year. 15-year-old Shannon Lee has made multiple visits after suffering two concussions in six months. The ringette player has watched video of her games over and over, but has no idea which collision caused her injury. "I just remember getting off one shift and being really, really dizzy, but I didn't remember why," said Shannon. "I didn't remember being hit specifically, I thought it was dehydration or something, so the next day I played, and then I played again." Experts say that is the worst thing to do. Debbie Friedman, trauma director at The Montreal Children's Hospital, says the effects of a concussion can be felt for months, and that one concussion can quickly lead to another. "The biggest thing is never, never, never, play through the injury," said Friedman. A concussion, in simple terms, means the brain has been shaken inside the skull. People who have had a concussion suffer from a variety of symptoms, some physical, some mental, including "headache, problems with concentration, fatigue, the fact that they are more sensitive to light and to noise, the fact that they are not as efficient in their everyday work," according to Dr. Friedman. Dr. Alain Ptito is studying the effects of concussions on children 10 to 17 years old by using MRI scans to measure brain activity before and after they are traumatized. In about one in five adults, the symptoms of a concussion persist for years, if not forever. Dr. Ptito expected children's brains to recover from a concussion faster, but it turns out they are no better at recovering. "This is worrisome because that means the brain is probably very vulnerable," said Dr. Ptito. Anyone who has had a concussion is three times as likely to suffer another, and there is additional evidence that even one concussion, let alone multiple, can cause depression, dementia, and more. Anthony Fiumidinisi is one player who has hung up his skates for good after getting three concussions in two years. "I was missing school, I wasn't playing hockey, and it was just really painful," said Fiumidinisi. He played through a concussion, and ended up getting injured even worse the second and third time. "I wanted to win by getting them back and I paid the price. I got another concussion," he said. His father says Anthony, like many players, never told anybody about two of his concussions. "You really have to look at them and figure out what's going on, because they don't tell you the truth," said Al Fiumidinisi. The self-denial, the desire to be tough, to play through the pain, is something that junior players do to imitate professionals. But even the best hockey player in the country isn't immune. Sid the Kid, the man who scored the golden goal during the 2010 Winter Games, hasn't stepped on the ice since early January. He was clocked on Jan. 1 during the Winter Classic. Five days later, a hit by TampaBay's Victor Hedman sent Crosby to his knees, and out of the game. "I think in the sport we're still dealing with an attitude of denial, of trying to minimize, or trying to underscore, of trying to play through that extra period and then we'll deal with it," said Dr. Ptito. Doctors are not sure if Crosby will return to hockey this season. "It's not going to do me any good to come back too early and be feeling like I do now, and obviously put myself at risk of it happening again," said Crosby. With the NHL's most recognizable player out for more than a month, possibly half a season, Hockey Canada is taking another look at its recommendations for junior players. Current advice includes having players sit after any hit if a coach is in doubt, and recommending players get a doctor's note before returning to the game. The organization also requires someone on every team to have basic concussion training, but according to Todd Jackson, "I think we want to ramp up that educational process and keep that module updated and effective." What will be done, and when, Jackson cannot exactly say. Shannon Lee has no choice, and will not be allowed to play until she is completely symptom-free. It's a moment her mother Trista Leggett dreads, saying "She doesn't see the big picture." "I'm listening to what people are saying and what the professionals are saying, and I'm very worried." Mathieu Menniti, at risk of a third concussion, tries not to think about. what could happen. "Any game can make a difference. You never know who's watching, and you know maybe while you're playing a scout is watching, and that's your ticket to the next level," said Mathieu. But it's also clearly evident that in any game, a career can be ended with a blow to the head. To view the full special report on concussions from CTV News, click here. For more information about concussions, click here to consult the MCH Concussion KiT and the Mild Traumatic Brain Injury brochure.